The school has many inquiries regarding CAD program, whether it is taught during the course or not. Our course is dedicated to the aspects of designing and planning the kitchens only and we leave open to option for presentation. However, candidates who want to learn Cad for free, please go to http://www.cad-training-course.com. See you in the (online) classroom soon! Carlo Colombo was born in 1967 at Carimate. In 1993 he graduated in Architecture from the Milan Polytechnic, but by 1991 he had already made contact with Giulio Cappellini, for whom he designed his first piece in 1992: the Kyoto bed, presented at the Salone del Mobile in Milan the same year. From this time on Colombo’s work as a designer flowed into hundreds of projects in collaboration with the leading firms in the sector: Antonio Lupi, Arflex, Artemide, BYografia, Cappellini, DePadova, Emmemobili, EMU, F.lli Guzzini, Flou, Franke, Fusital, iGuzzini, IOC, Paola Lenti, Levi’s, Mood-Flexform, Moroso, Nube, Oluce, Penta, Poliform, Poltrona Frau, Riva 1920, Rugiano, Sabattini, Serralunga, Tecno, Teuco, Varenna, Zanotta. Slovenia, Ukraine, Australia, Russia, Britain, Brazil and China. Apart from product and furniture design, Colombo undertakes business and marketing promotion for companies, works on graphic design, curates exhibitions, works as consultant and art director (since 2006 and for Arflex and since 2008 for Stratex). Entrepreneurs were among the first clients for the houses he designed, but they soon commissioned showrooms, sales outlets and production facilities, like the Poliform Lab opened in 2011 in the heart of Brianza. Colombo’s work as a designer, initially focused on product and interior design, has been progressively extended to the construction sector in Italy and abroad. In 2009 he won an international competition for the design of two multi-functional towers in Abu Dhabi and his renewed interest in architecture has found scope in teaching in China, where he has lectured on design since 2011 at the De Tao Masters Academy in Beijing. For over 65 years the company produces bespoke kitchens. A great experience that comes from a long history of tradition and innovation. The craftsmanship and technological research, constitute the real guarantee of quality and durability have always been distinctive Snaidero kitchens. Design is a term that means, for a time, "plan" and "project." And for Snaidero, in fact, doing design means taking responsibility to outline, first, and to develop, then, a thought made ? ?and harmonious on the world. With a dynamic attitude and full of cultural awareness, which can also invest the whole process of business activities: the production, such as the distribution of resources and the relationship with the customer. There is in this aspiration concrete to help create a balance that involves both subjects, the producer and the consumer. Ola20 offers the smoothness of curved sign, formal synthesis of life and movement. A soft and distinctive design, which refers to values ? ?of design inspired by the safety and rational use of space to meet the needs of today's life style and more modern and up. A molded design on gestures domestic operations and absolutely free of sharp edges and corners "live", in fact, meets - and does not clash - with your daily life, embracing fully the evolution of contemporary architecture. Kitchen a strong visual impact, Venus is the ideal stage for those who, through space, wants to freely express their creativity.And so transfigure the gestures and customs of the town lived in the extraordinary nature of everyday life. Due to its large projects, in fact, Venus offers maximum freedom of composition and customization. Why is a kitchen free from schemes and therefore able to satisfy, by virtue of a distinctive design, high-impact, the needs of the domestic spaces fluids and contemporary. Skyline 2.0 is the kitchen which is measured by your horizons, orienting each day on the natural logic of your gestures, in a completely different way. Through an innovative design that escapes the conventional schemes without sacrificing comfort and functionality. 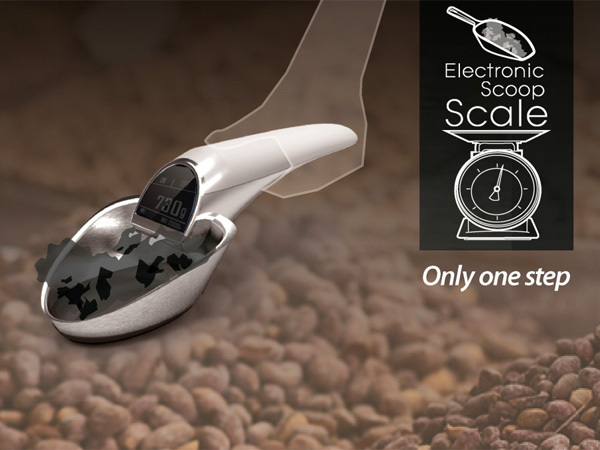 Scoop is an electronic scale integrated into the measuring scoop, intended for the local grocers who sell by the measure. It is not only handy in eliminating a step, but also promises accuracy. 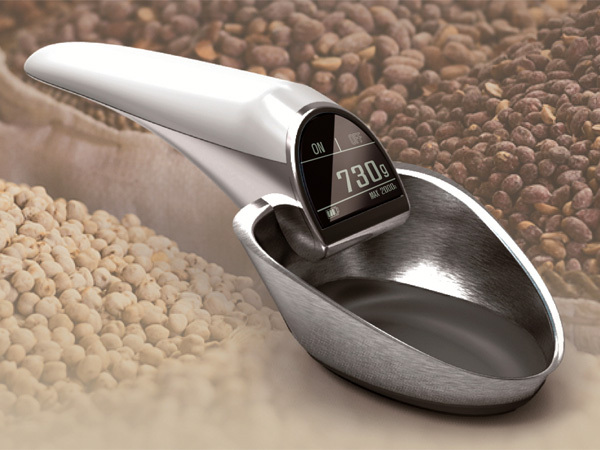 I can picture this being used in kitchens as well, especially when we need to bake and measure out the ingredients as accurately as possible. Over all, a nice plausible design! A panelled kitchen is often about matching a broader aesthetic. However, modern balance is always required – traditional good looks cannot be at the expense of responsive functionality. This kitchen with stone work surfaces and classic panelling is by kitchen designer Robyn Labb. The cabinetry style is a response to the age and look of the 1930s home, and inspiration for the two-tone colour scheme came from an old black-and-white photograph that hangs in the greater space, the designer says. "The honed black granite benchtops and splashback were also chosen to pick up on the basalt fireplace surround in the family room. The white vein connects well with the cabinetry, too, drawing the elements together visually." While the island and rear cabinetry are in a semi-traditional or transitional style, the tall oak cabinets have been given quite a different treatment, with more contemporary, clean-lined doors and a contrasting distressed wood finish. "The mix of the rough and the smooth gives this kitchen a balanced, interesting look," says Labb. "If it had been all oak, the black stone would have looked too heavy. And an all-white kitchen might have lacked visual appeal. "The other major surface is the stainless steel rear benchtop. This was a practical choice and the metal also complements the few appliances on show – most of these are integrated." Much of the storage is concealed, too, with cupboards in the island passing for ornamental panels. At the living room end of the island, a refrigerator and crockery cupboards are also hidden in this way. Similarly, the powerful rangehood is set invisibly under upper cabinets. Fitted with high-tech Blum hardware, these open out and up at a light push or gently close with the push of a low button. Ironically, by simplifying the design, the modern-day functionality furthers the old-world charm. Launched in 2002, the GBCA is a national, not-for-profit organisation that is committed to developing a sustainable property industry for Australia by encouraging the adoption of green building practices. 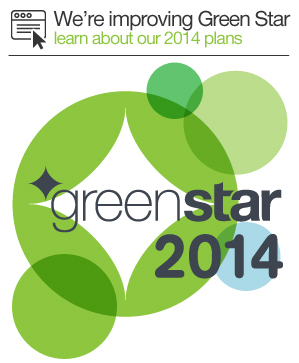 It is uniquely supported by both industry and governments across the country. Mission The Green Building Council's mission is to develop a sustainable property industry for Australia and drive the adoption of green building practices through market-based solutions. Objectives Its key objectives are to drive the transition of the Australian property industry towards sustainability by promoting green building programs, technologies, design practices and operations as well as the integration of green building initiatives into mainstream design, construction and operation of buildings. For the masterly technique employed by the local carpenter Crisow von Schulz who constructed the cabinets from a single elm tree. The organically curving lines were intended as a contrast to the rectilinear architecture of the houseboat. Sadly, even a great design can be spoiled by bad planning: cooktop too low and too recess from the bench and front of the base units, the gap between cooktop and base units far too large, wall units too close to the ceiling and once opened, hard to grab the handle.